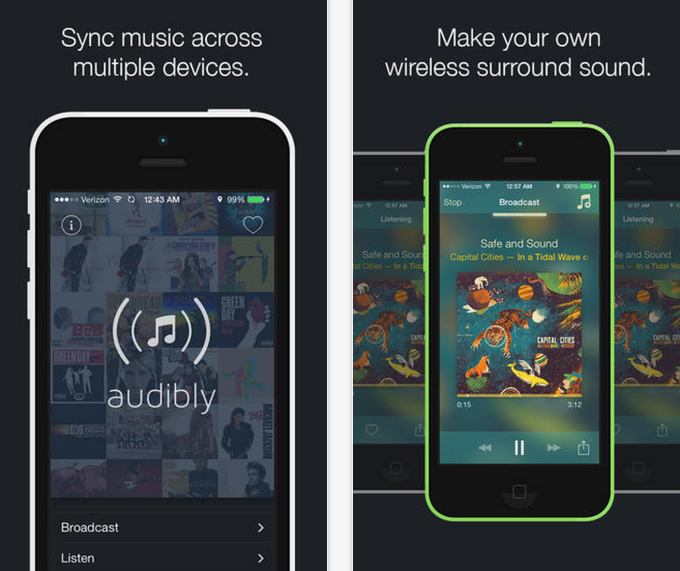 A team of three young coders has come up with a way to turn your iPhone’s speakers into a wireless surround-sound system, thanks to a mobile app called Audibly. 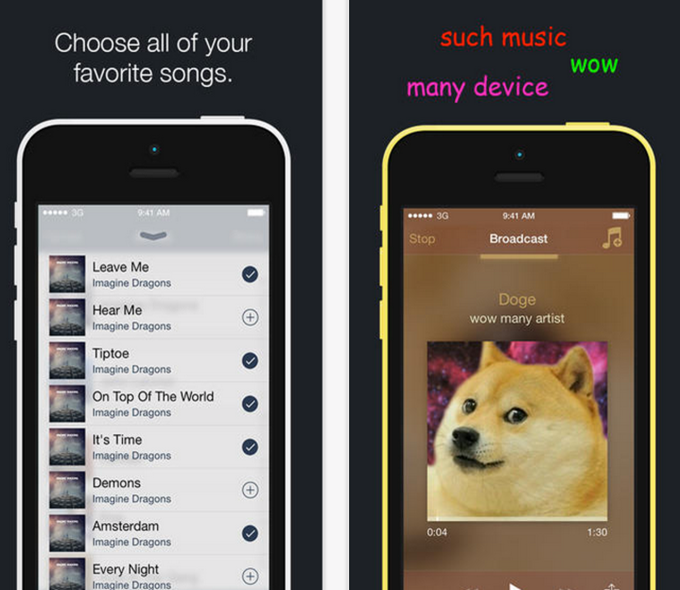 The app, which is perfect for parties or for blasting music when decent speakers aren’t readily available, uses technology found on newer devices (running iOS 7 or higher) in order to sync songs to multiple people’s iPhones or iPads simultaneously, effectively turning them into an ad hoc surround-sound system. Audibly’s co-founders first met last year at WWDC 2013 after receiving one of the many scholarships Apple gives to student coders who would never be able to otherwise afford the ticket prices. In 2013, Apple invited 150 students to attend its annual developer conference, but this year, it expanded that to 200. Explains Audibly co-founder Veeral Patel, a 17-year-old high school student from New Jersey, one of the best things about attending WWDC was meeting other like-minded people. “We hadn’t known any developers in our area, and WWDC gave us the chance to make friends that were just like us,” he says. Patel and the remaining team members, Nick Frey and Chris Galzerano, were sitting in a WWDC session on multi-peer connectivity — then being introduced in iOS 7 — when they came up with the idea for the app. In fact, they were so excited to get started, they didn’t even finish the session. Instead, they ran to WWDC’s Labs to get help from Apple engineers as they began to code. By the end of the conference, they even had a working prototype of their idea in place. Over the course of the next year, the founders, who were all attending high school in separate states (Frey in Iowa, Galzerano in Pittsburgh), continued to refine their idea. They chatted over Facebook Messenger, taking some breaks along the way to focus on school. Initially, they had the app actually transferring the entire song from one phone to the next, but found that took far too long. So they settled on streaming the song instead. In other words, the person who has a physical copy of the song saved on their iPhone can use Audibly to stream it to their friends’ devices by tapping the “broadcast” button in the app. Those who want to receive the stream will launch Audibly, and tap on their friend’s name to connect. The person streaming then approves the request and – tada! – makeshift wireless speakers. Plus, when you’re listening to a shared track, you can favorite it with a heart. Later, you can return to your list of favorites to play those again in Spotify or Rdio, or buy the track for yourself on iTunes. Now that Audibly is live, the team is working on what comes next: integrations with more services. Now you have to have a physical copy of the song to start the stream, but they’re looking to tap into APIs for other services, like Spotify or Beats, to share tracks via cloud music services, too. They’re also working on YouTube integration, which would let one person paste a YouTube URL to allow recipients to hear the audio stream for that video. The co-founders also just met up for a second time at this year’s WWDC 2014, where they’ve now learned another handy trick: making money. In a future release, they’ll implement an affiliate model, allowing them to take a percentage of the iTunes purchases made through their app. In the meantime, Audibly is a free download here on iTunes. It works reliably with up to 6 devices, we’re told, but you can use more.